Pie Base is a short pastry. It is unlike hot water pastry and it is not like the typical shortcrust pastry known to loving grandmas the world over, either. It is made by what is referred to as the ‘Creaming Method‘ – a method that has been documented, and known to bakers, since at least the turn of the 19th Century – (p336). 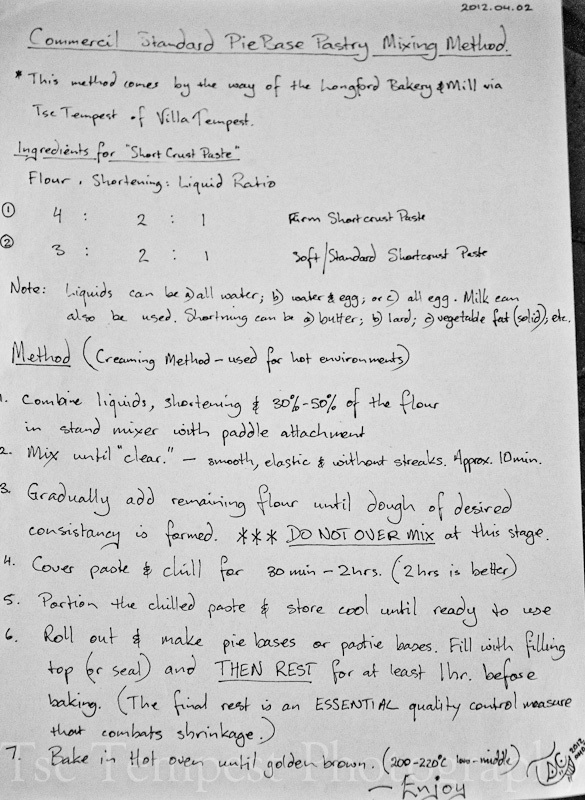 This method is an alternative method for making pastry, particularly in hot, arid climates. In essence this method has part of the flour and all of the fat creamed together first with the water until ‘clear‘ and then the final pastry dough is adjusted with the remaining flour, usually by the experienced touch of a skilled Baker. Understand this well, instead of the flour and fat ratios being fixed and the water ratio being variable, here the fat and water ratios are fixed and the flour ratio is varied until the desired result is achieved.